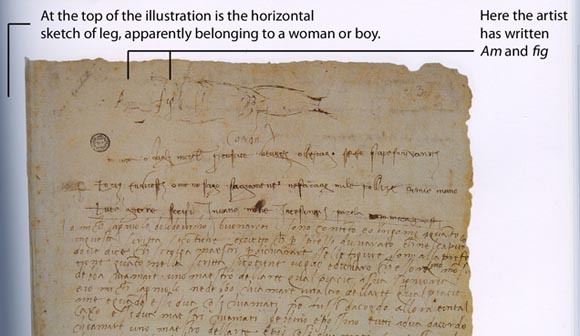 At the top [of the illustration, a few pages away] … is the horizontal sketch of a leg universally credited to Michelangelo and apparently belonging to a woman or a boy. At the left of the open top of the leg, the artist has written Am and fig, the latter actually appearing inside the outline of the upper part of the limb. You want my guess as to why things weren’t done this way? Two reasons: Professor Barkan uses Word rather than a page layout program like InDesign (no shame in that — those programs are awfully tough to learn). And the workflow in place at the publisher, Princeton University Press, doesn’t easily let authors mark up figures with custom placed captions. The end result: a diminished reading experience. Tools don’t equal talent, goes the saying. Too bad the tools most of us use don’t capture the simple things most of us would say if we were talking to each other.